Hands down, an aFire remote control ethanol fireplace is designed around the concept of SAFETY. Even features that might at first look seem like convenience – are primarily focused on your safety and those around you. Ethanol has a low flash point (57ºF). That means at room temperature (72ºF) it’s already converting into ethanol vapor. 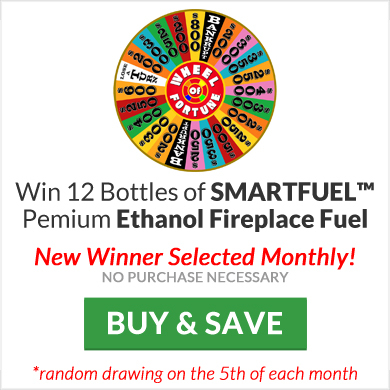 So while you’re filling the 2.5 Liter or larger tank of your fireplace, ethanol fumes are already starting to build. That’s why, when you attempt to light your fireplace, requiring you to stick your hand inside the fireplace, you may experience a large “POP” as the vapors ignite. Probably not enough to injure you – however, it does startle most people, making the experience of lighting your fireplace unsettling. A remote control ethanol fireplace on the other hand is an entirely different animal. Rather than directly burning the fuel present in its fully exposed storage tank, the fuel tank in an aFire electronic ethanol burner is separate from the combustion tray and sealed. During the ignition sequence, the medical grade fuel pump begins pumping a small amount of ethanol into the combustion tray located at the top of the burner. Almost immediately an electronic glow plug (similar to what might be used in a diesel car engine) glows red hot, gently igniting the fireplace – almost unnoticeably and without any drama, the flame simply appears. No need to stick your hand inside the fireplace, no unsettling “POP” as the ethanol vapors ignite. Just push the button on the included remote control, then just sit back and RELAX…. From this point forward there are no worries as the onboard electronic safety technologies built into the unit do their job. 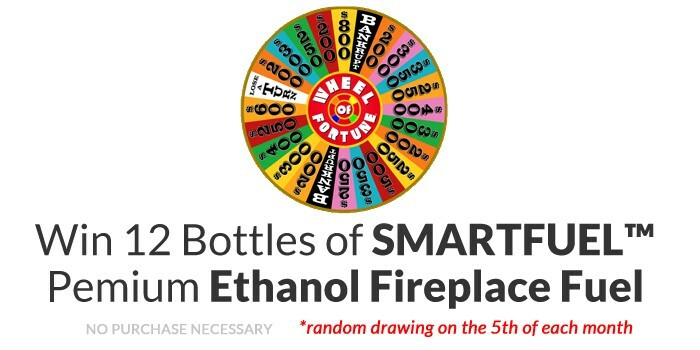 Which leads me to reason #2 for spending more for an aFire remote control ethanol fireplace – SAFETY. With a manual ethanol fireplace or burner, what you get is a metal box that you pour ethanol fireplace fuel into. The flames are created by burning vapors generated from the large amount of ethanol fuel stored in the exposed tank. That’s what you get, and nothing more – end of story. Fuel Sensors: Monitor fuel levels in the tank, in the combustion tray, and most importantly – in the “spill tray” (the tray located directly below the combustion tray). In the rare event there is a malfunction and fuel were to overflow from the combustion tray into the spill tray below – these sensors are triggered, immediately shutting down the unit and eliminating danger before it can become a problem. Temperature Sensors: Temperature sensors are present that monitor heat generated by the unit at the combustion tray, and the fuel tank. 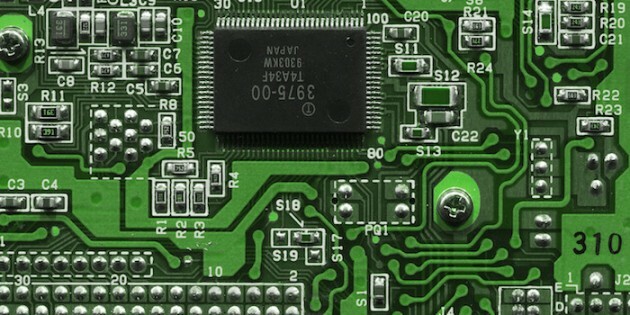 Should the unit begin to overheat for any reason – the sensors will trigger and the unit will shut down. It is then not possible to refuel or restart the unit until it cools to a safe temperature. It should be mentioned that due to the positioning of the combustion tray at the very top of the burner, the exposed top plate of the burner and the entire burner housing stay relatively cool to the touch. I was able to comfortably place my hand on the top plate of the burner even an hour into the burn. I don’t recommend trying that with a manual burner as the flame is actually burning inside the manual burner’s entire housing, so it tends to get excessively hot – requiring greater clearance and insulation. CO2 Sensor: This is an essential safety component of every aFire remote control fireplace or ethanol burner. One not present on any manual ethanol fireplaces or ethanol inserts. Regardless of how clean the ethanol fuel burns, fire consumes oxygen (O2). If you deplete available oxygen in a room it creates a dangerous situation for people present in the room – as the oxygen level drops, carbon dioxide (CO2) levels naturally rise. As humans require O2, not CO2 in order to breathe, this presents a danger. This is especially true if the fireplace is located in the bedroom or bath. 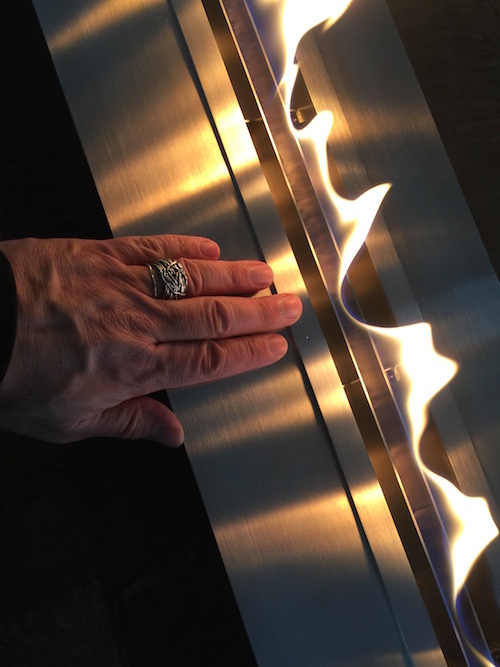 We have an article you can read addressing just this topic, read it here: Size Matters – How To Correctly Size Ethanol Fireplace To Your Room. Our CO2 sensor monitors the CO2 levels in the room. Should the level rise to a dangerous point – the sensor triggers, shutting down the unit, avoiding a dangerous situation. Accelerometer: Much like your Apple iPhone which uses an accelerometer to navigate games, orient content on your screen, etc. – an aFire remote control ethanol fireplace or burner has an accelerometer that will trigger in the event of the fireplace being tipped over accidentally (potentially creating a spill of ethanol fireplace fuel). If triggered, the unit shuts down, stopping the pump from delivering more ethanol fuel into the combustion tray. As there is never more than a few centiliters of ethanol in the combustion tray – there is never a dangerous amount of exposed fuel present. Contrast that with a manual burner that if tipped over, has nothing to stop the entire 2.5 liters of ethanol from spilling onto the floor. If flame is present the results could be disastrous. Seismometer: Maybe not as crucial, unless you live in an earthquake prone area, we have a seismometer built into every aFire burner. Should the unit be jarred severely by an earthquake or even a series of hard impacts to the unit, the seismometer triggers and the fireplace shuts down, eliminating any immediate danger. 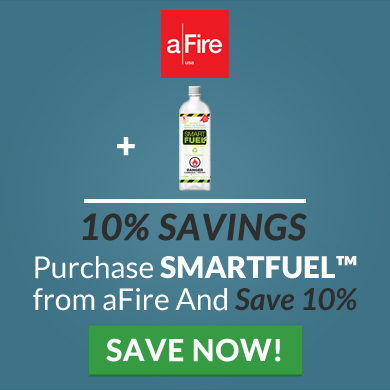 All of this leads us to the third and final reason for paying more to own an Afire remote control ethanol fireplace or ethanol burner. Did I mention, SAFETY? A manual ethanol fireplace may cost less. It may be well built, and it may function as promised. But a manual ethanol fireplace represents “dumb” technology. Like the scarecrow in Wizard of Oz , it can only sing about a brain – because it has no “brain”. On the other hand an aFire remote control ethanol fireplace or ethanol burner has a sophisticated CPU (in fact several) that act as a computer “brain” controlling all aspects of the operation of your ethanol fireplace. It controls the medical grade fuel pump that fills the combustion tray where the flame resides (at the top of the burner). It integrates with all the safety sensors listed above to ensure your unit is operating Safely, Efficiently, and as expected. And, it creates convenience by taking commands from the included one button remote that allows you to initiate or extinguish your fire from the convenience of your sofa, your bed, or your bath. It is truly Intelligent Technology. In fact, an aFire remote control fireplace or ethanol burner can be easily integrated into any home automation system you might already have installed in your home or business. Obviously Safety, Convenience, and Intelligent Technology come with a price. At aFire we won’t ever apologize for that. We choose to use only the best quality components (pumps, sensors, CPUs) available – because, in the end, you can’t put a price on your safety, and the safety of those around you. That’s why we have been awarded CE, EMC and FCC certifications for all our ethanol fireplaces and ethanol burner inserts.